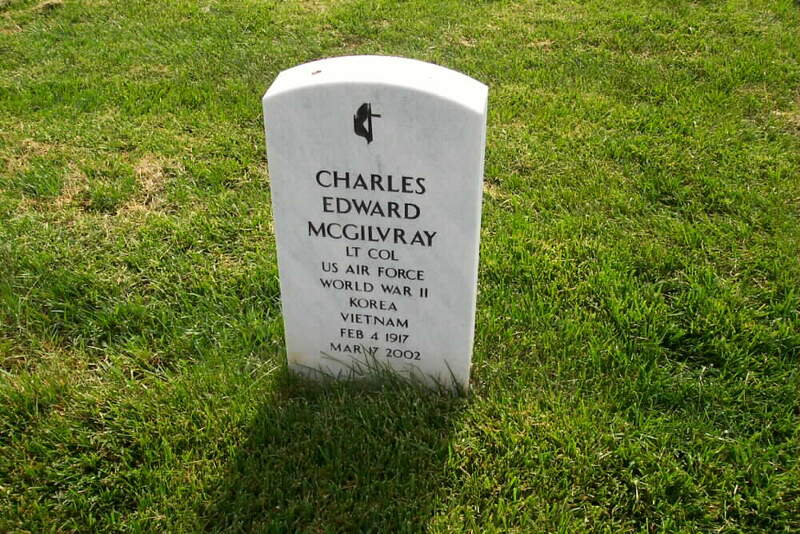 BAY PINES, Fla. -- Retired Lieutenant Colonel Charles Edward McGilvray, 4326 Marcott Circle, Sarasota, Florida, died Sunday afternoon, March 17, 2002, in Veterans Administration Medical Center. He was 85. Born February 4, 1917, in West Middlesex, Colonel McGilvray was a son of Harry C. and Gertrude Bateman McGilvray. After enlisting in the Air Force during World War II and attending officer's candidate school, he was commissioned a Second Lieutenant. Colonel McGilvray also served in the Korean and Vietnam conflicts as a flying officer with special duties in electronic warfare; was a flight test officer for airborne weapons systems; and a combat crew commander at a Titan II missile base in Little Rock, Arkansas. He retired from Kelly Air Force Base in San Antonio, Texas. He and his wife of 60 years, the former Annabelle E. Stock of Sharpsville, whom he married July 19, 1941, in Olathe, Kansas, retired to Florida. She survives along with: one daughter, Pat, wife of Lee Chapin, Sarasota, Florida; and Linville Ridge, North Carolina; and one granddaughter, Kelly, wife of Dean Dancer; and two great-grandsons, Michael and Mason Dancer, all Sarasota. Also surviving are: two sisters, Jean, wife of Edward Hohman, Hermitage; and Margery, wife of Pat Buzzeo, Waldorf, Maryland; along with many nieces, nephews and other relatives in the Shenango Valley area. Colonel McGilvray was preceded in death by four sisters, Alberta Ehrhart, Edna Staudenmayer, Frances McCormick and Jackie Tidmarsh. Memorial contributions may be sent to Sharon Regional Health System's Hospice Home Care, 490 N. Kerrwood Drive, Suite 204, Hermitage 16148. Always an inspiration to his family, he will be sadly missed and always loved. Graveside services and interment will be held at a later date in Arlington (Va.) National Cemetery. Information concerning this individual is being sought. Should you have such information to contribute, please contact the Webmaster.